NETWORK FINALS: ABC’s STILL STAR-CROSSED may soon have company on Saturdays, as SOMEWHERE BETWEEN fell 0.1 in final numbers to a deadly 0.3. In addition, WORLD OF DANCE and the rerun of BROOKLYN NINE-NINE lost 0.1. And as expected, both CW reruns were adjusted for their NY preemption and dropped 0.1. CABLE HIGHLIGHTS: SHARK WEEK gave Discovery a Tuesday cable victory, with SHARKS & THE CITY LA at 0.78, its NY counterpart at 0.73, and SHARK AFTER DARK at 0.48. On USA, WWE SMACKDOWN slipped 0.04 to 0.77, and SHOOTER was down 0.09 to 0.32. OWN’s HAVES & THE HAVE NOTS dropped 0.06 to 0.60. On Bravo, BELOW DECK rose 0.06 to 0.55, and A NIGHT WITH MY EX held at 0.23. 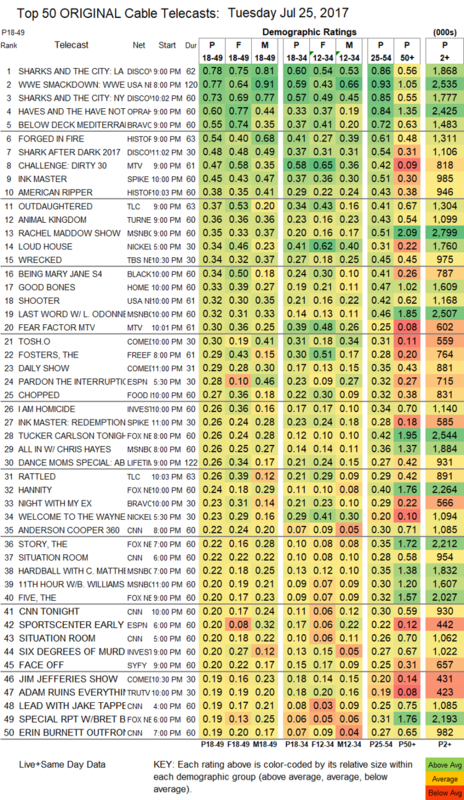 On History, FORGED IN FIRE gained 0.03 to 0.54, and AMERICAN RIPPER was up a tenth to 0.38. MTV’s THE CHALLENGE slipped 0.02 to 0.47, and FEAR FACTOR ticked down to 0.30. Spike’s INK MASTER climbed 0.08 to 0.45, and the REDEMPTION after show was up 0.07 to 0.26. On TLC, OUTDAUGHTERED was steady at 0.37, and RATTLED ticked down to 0.26. TNT’s ANIMAL KINGDOM fell 0.04 to 0.36. The cable news race followed recent patterns, with MSNBC’s RACHEL MADDOW SHOW on top at 0.35/2.8M, above Fox News’s TUCKER CARLSON TONIGHT at 0.26/2.5M, and CNN’s ANDERSON COOPER 360 at 0.22/1.1M. Nickelodeon’s afternoon LOUD HOUSE was at 0.34. 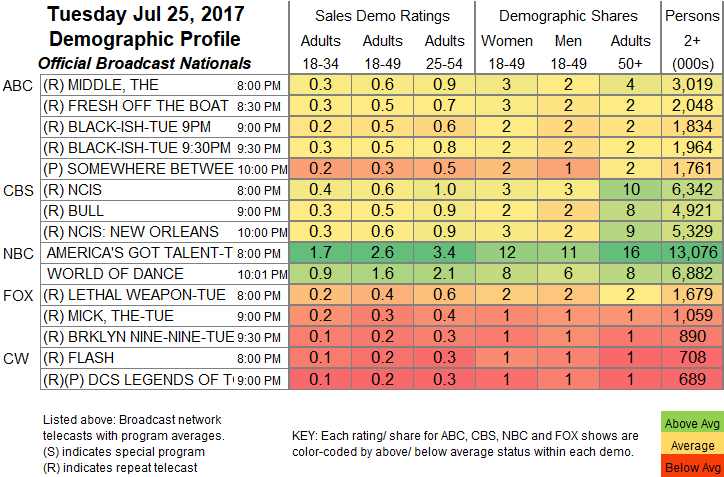 TBS’s WRECKED dropped 0.03 to 0.34. BET’s BEING MARY JANE rose 0.07 to 0.34. On HGTV, GOOD BONES fell 0.04 to 0.33. Comedy Central’s TOSH.0 dropped 0.03 to 0.30, and the newly-renewed JIM JEFFERIES SHOW ticked down to 0.19. On Freeform, THE FOSTERS ticked down to 0.29, and THE BOLD TYPE was up 0.03 to 0.16. Food Network’s CHOPPED lost 0.03 to 0.27. On ID, I AM HOMICIDE fell 0.03 to 0.26, and 6 DEGREES OF MURDER was down 0.02 to 0.20. A DANCE MOMS special on Lifetime was at 0.26. Syfy’s FACE OFF gained 0.03 to 0.20. On Tru, ADAM RUINS EVEERYTHING fell 0.05 to 0.19, and YOU CAN DO BETTER was down 0.06 to 0.07.